In this section, we meditate in the same way as we did in , , and  of Prayer with Fantasy. We now look at John 13:1-15. We first imagine the room where the supper takes place. How big is the room? Is the ceiling high, or low? What color are the walls? Is the room well-lit, or dark? Suddenly, Jesus stands up during supper. 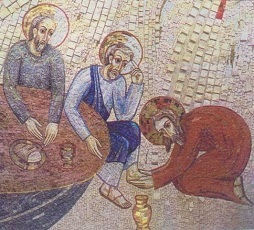 He asks a servant to pour water in a basin and bring cloth to tie around his waist and a towel. Finally, Jesus comes to you. He tells you to extend your feet. How do you act? How do you reply to him? You extend your feet, urged by Jesus. He touches your feet with his soft and warm hands. He washes your feet carefully with gentle stroke. How do you feel?